Click for Harmony: About Me and Horses, Chapter One. About Me and Horses, Chapter One. My first introduction to horses was a pony ride at a fete when I was three years old. I don't remember it but I'm told I was heartbroken when it ended and I was lifted off the pony's back. At the age of eight I announced that I wanted to learn to ride. My parents knew nothing about horses and my mum told me that I'd have to find a riding school and book some lessons myself, thinking that would put me off. Not only did I do that but I also managed to buy some second hand riding clothes from adverts in the local paper, all by myself! I've always been resourceful. I continued to have lessons for years without learning very much. When I was about ten I got a bike which I pretended was a horse, and cycled far and wide looking for horses in fields to visit. In the following years I used plan my weekends by looking up in Horse and Hound where the nearest horse show was and, if it was too far to cycle, I'd work out bus routes to get there. I would end up in the nearest town or village with no idea exactly where the show was but I always managed to find it somehow. I loved watching all those horses and riders gathered together and dreamed of the day when I'd be there too. After finishing my O' levels with good results I realised two things; that I couldn't face two more years of school and that I'd never be any good at my passion, horses, unless I devoted myself to them full time. My parents were horrified (my mum was a school teacher and had planned on my going to university) but I was adamant. I left school that summer and got a full time live in job at a small riding school. 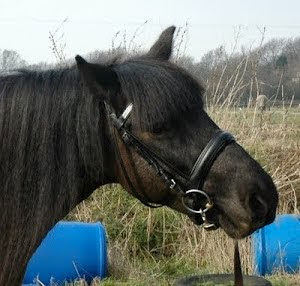 I loved the horses, all the riding and being there all the time but there were a few problems at the riding school. The person who ran it and I lived in two caravans, side by side, on site. She had a boyfriend who she had violent arguments with, culminating in him trying to strangle her one weekend. He went missing after phoning for an ambulance, there were police and ambulance men everywhere and I was a bemused not-quite-seventeen year old who had led a sheltered life up to then, right in the middle of it all! With the help of a lady who worked there part time and the children who helped at weekends we managed to keep the riding school running, lessons included, for the next few days until the owner was released from hospital but, in the meantime, I had to deal on my own with some irate feed suppliers who hadn't been paid and were threatening to cancel deliveries. With about twenty five horses and ponies to feed, some fully stabled, we got through a lot of feed. The next drama made me decide that working with horses wasn't for me and to try going back to school for A-levels instead. I was at the riding school alone one day when the hay barn, right next to our caravans, caught fire. There was no innocent reason why it should have done - no bonfires, no smokers around - and suspicion fell on the, now ex, boyfriend. I called the fire brigade and dealt calmly with the incident but, strongly encouraged by parents to do so, handed in my notice shortly afterwards. I went back for the first year of A levels but didn't settle and couldn't think of anything I wanted to do with my life except be with horses so, when I saw a part time job with hunters advertised in the local paper I applied and was offered the job. It was within cycling distance of home and school and I did carry on at school, fitting in looking after the two hunters as well, to begin with. The crunch came a few months later when the family who owned the hunters - General and Joss - told me they were moving. 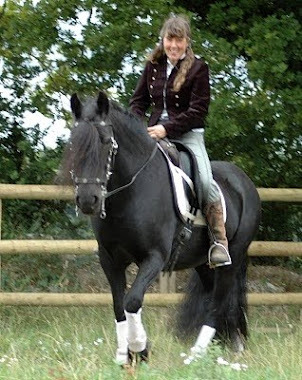 By then I was totally besotted with them ,especially General (16.2 bright bay 6 year old who was as honest and kind as anyone could ever wish for), so I left school for good, bought a motorbike, and commuted to their new home each day. I had been winging it until then really - looking up how to feed and care for hunters in books because their owners were as clueless as I was. Their new home had been home to a hunt master and his family and horses and there was a bit of an overlap between our horses moving in and their horses moving out. This meant that I got to work with their very experienced stud groom for a couple of months and he loved having an earnest, keen pupil. He taught me how to clip, plait and turn out horses to a high standard, and how to get them really fit and feed them for peak performance. I loved every moment of working with him and learning so much and I was like a sponge, soaking up all the information I could get. He was a bit tougher with his horses than I would ever want to be (General didn't like him at all and wasn't his usual enthusiastic self when he was around) but I did learn from, and try to copy, his determined, confident attitude around horses. I stayed with the hunters for a few years and finally acquired my first horse (pony) while I was there. 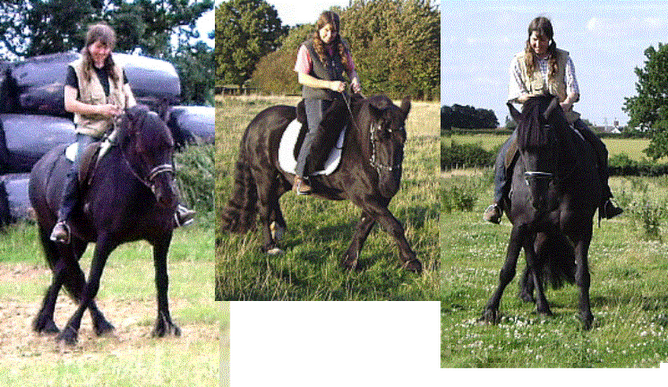 I didn't have much to do in the summer so, when I heard that a little eleven hand black pony who I passed everyday on my motorbike and had always liked the look of, was for sale for £25 I bought him to give local children lessons on. Rocky was so cheap because he was traffic shy but I led him out around the roads from General's back and he soon became bombproof in traffic. He was a lovely pony and the children always thought they could ride because he'd just follow me around so they never had to be led. I soon had requests to teach older children and the family I worked for were keen for me to find a way to earn enough money to stay on over the summer and offered to buy a cheap bigger pony. I saw one advertised and went to meet a hugely overweight fourteen hand eight year old barrel called Ben. 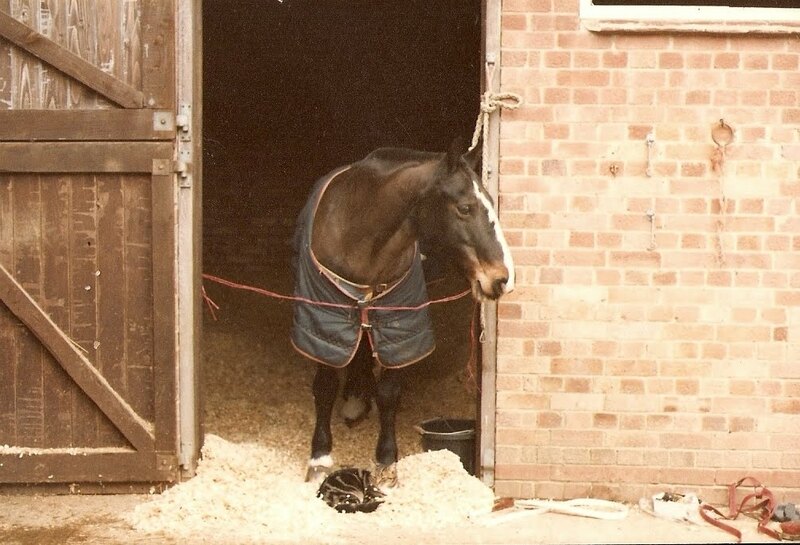 His owners had bought him from a dealer a couple of years before for their daughter but he'd been too strong for her and had frightened her so she'd given up and left him in the field. He was the grand sum of £150, very cheap even then. He was very nervous but had big, kind eyes and I wanted him to be mine so I bought him with my own money. Ben was scared of everything and a nightmare to catch but he was all mine and big enough for me to ride. I figured he'd had a tough life to end up at a dealer's yard and he just needed a friend. I spent as much time with him as possible and he quickly became steady enough to lead children around on but would run away at the drop of a hat when I was riding him so I dared not let him off the leadrein. A young friend of one of the daughters of the family I worked for used to help out at weekends and holidays and she took a shine to Ben. She was a competent rider and wasn't put off by his lack of brakes and she riding him out with me and the hunters. A few months later there was a show locally and she begged to take him. We hacked there together and she tried to get him around the clear round jumping but, although he'd jump anything in front of him, he was too strong to steer. She has a go at some gymkhana games with similar results then asked to take him in the Chase Me Charlie. For anyone who doesn't know this is a knockout competition with one fence which starts as a pole on the ground and gets higher and higher until only one pony clears it. The ponies queue up one behind the other to jump it. The young girl who was riding Ben had never jumped more than about two feet nine inches in her life. Ben just kept on jumping until it was just him and one good showjumping pony, who we knew, left in. The fence was measured at four feet and the serious showjumper went first and refused. Ben grabbed the bit, took off with his by now petrified jockey and cleared it with inches to spare! His rider promptly fell off as he landed and had to be treated by St John's Ambulance for a sprained wrist but was smiling through her tears - they'd won! He was admired and congratulated by everyone, including the showjumper's parents, and we were all stunned and in shock! Ben had arrived at the show as an unreliable pony with no brakes and no steering and he went home a hero and the yard superstar! From that day on Ben never looked back. He basked in our admiration and became the most trustworthy, sensible, kind, friendly and honest pony anyone could ever wish for. I had him until he had to be put down due to the ravages of Cushing's Disease at the age of twenty eight and I did everything with him from dressage to showing, gymkhanas to cross country, and he always came home loaded with rosettes.He was highly placed in a Pony Suitable for Riding for the Disabled competition, missing the winning rosette only because he still took a bit of a hold going into a jump. I used to do a show in Family Pony competitions where I removed his bridle and did the individual show, jumps and rein back included, with just a neck strap. We qualified for the South of England Family Pony Championships where he was seventh with his own fan club of spectators who took an instant shine to him (the jumps were quite big, which didn't worry Ben but did worry most of the other chunkier ponies, and a lot people said he was the only true family pony in the final line up). Everyone, from judges and spectators to vets and farriers, loved him and he radiated happiness. He was the most gentle, kind, friendly, affectionate pony I've ever known and he was the reason for everything I did, from getting up in the morning onwards. I love reading your stories!! Ben sounds like he was an awesome pony! !